Massage over a movie. How can you say no to that? Both are my weakness that's why I found myself seated in a La-Z-Boy at Bluewater Day Spa a couple of days ago for the launch of Backjoy's newest campagn called "Straight Up". 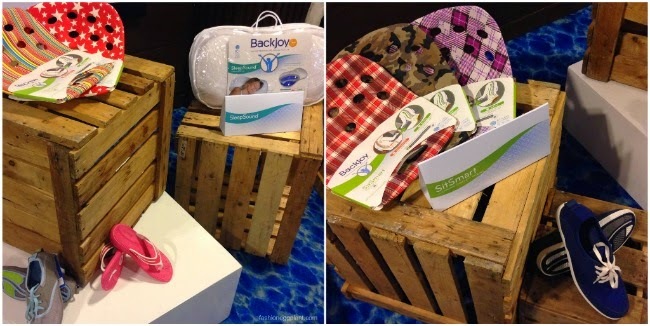 The afternoon was all about comfort as Backjoy introduced it's new line of products to us. Backjoy is all about spine health. They create products which help correct and improve our posture. The StandRight line of footwear features "Active Stabilization Technology": which help users walk correctly (through the natural gait line system) and improve their posture (through an integrated system). "The natural gait line system is the pattern of the foot efficiency created when the feet meet the ground in stance and step for normal alignment and function. Foot efficiency depends on the way the bones and joints in the foot move in relation to each other. These components work together to provide the body with posture, support, balance and mobility when you stand and walk." Did I mention how comfortable they are??? Oh my god, they are, you'll feel it immediately once you slide a pair on! Aside from StandRight, Backjoy also carries Sit Smart which I think is their first product (?) and I'm pretty sure you've all come across it in the malls? Sit Smart is a nifty little seat which help relieve pain and allows you to sit in comfort for extended periods of time. Perfect for those with 9-5 corporate jobs. And lastly, my favorite of all the "Sleep Sound" category which features the Sleep Pillow. The Sleep Pillow uses a patented layered technology that automatically floats the head in optimal sleeping posture which aligns the neck and reduces back pain. Also, it has a removable cover with 2 sides: a plush (warm) or smooth (cool) side! Visit Backjoy Philippines at these branches: Ayala Cebu, SM Fairview, SM MOA, SM Megamall, SM Annex, SM Cebu, Robinsons Place Manila, Robinsons Magnolia. Black is really an edgy color! Wow! It's good that you were allowed to shoot ib Megamall. Thanks FashionEggplant for the nice article mentioing Deep Dips at the Chef's Lane in Market Market as part of the Ayala Malls 2014 celebrations.